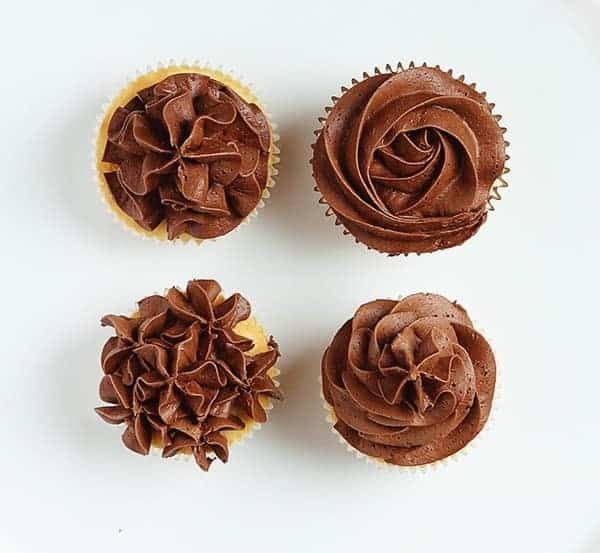 Today I am sharing four easy and beautiful ways to frost a cupcake using any open star tip, or 1M tip. 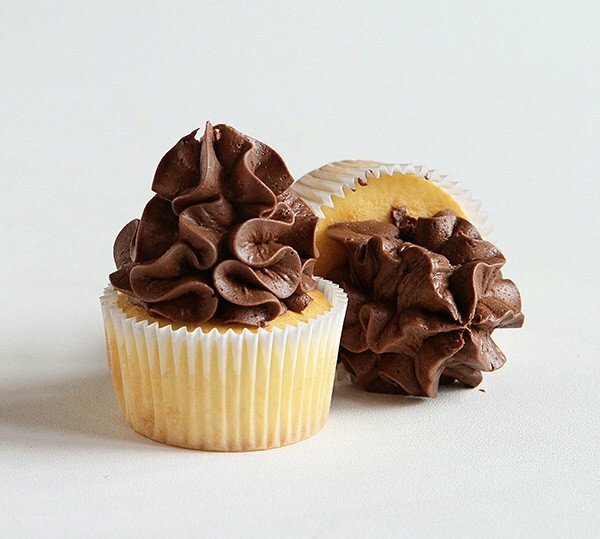 These techniques on how to frost cupcakes are perfect for any level baker and look like they are straight from the bakery! I am a huge huge fan of the open star tip. I use it on 90% of my cake designs and 99.9% of my cupcakes. 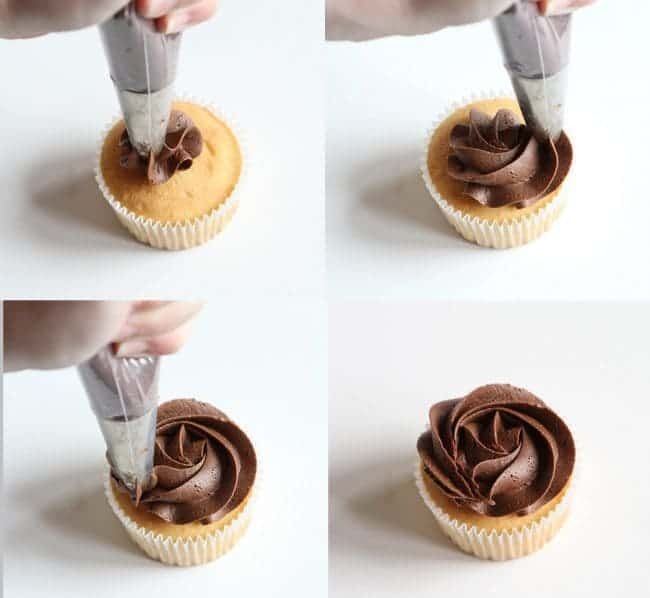 Today I thought I would show you four really easy techniques to decorate a cupcake. There are, of course, unlimited possibilities as to how you can use an open star tip. I could probably do three more posts just like this one! But for now, I will just stick to the basics. 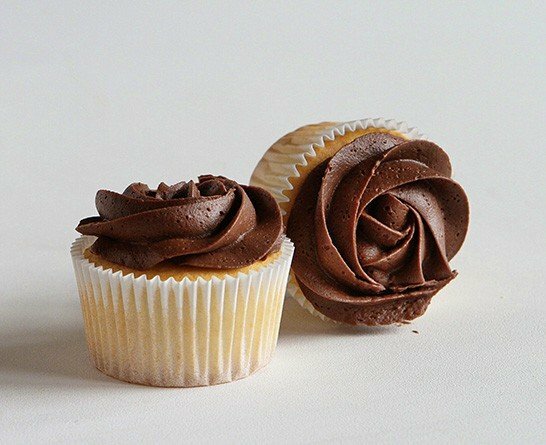 For these cupcakes, I recommend a great white cake recipe as well as an amazing chocolate buttercream recipe! 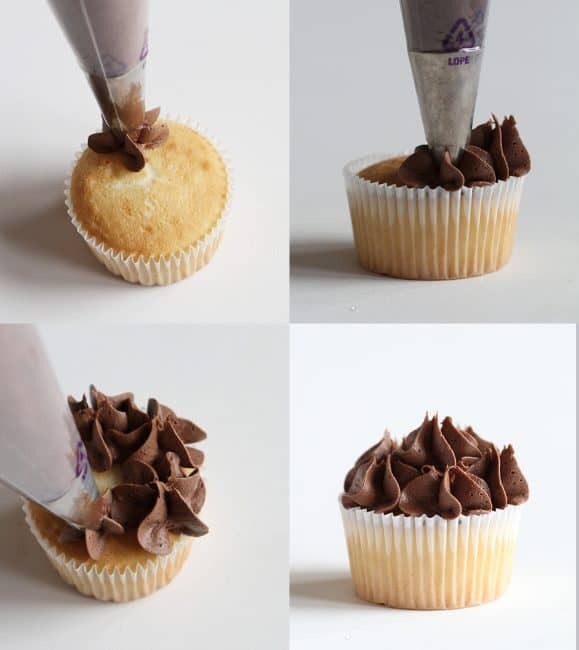 A few simple tools can make a world of difference when decorating cupcakes! The 1M tip, or open star tip, is readily available at most grocery stores today and are very inexpensive. (and often come with piping bags!) You will want to be properly prepared with all of your tools and cupcakes. 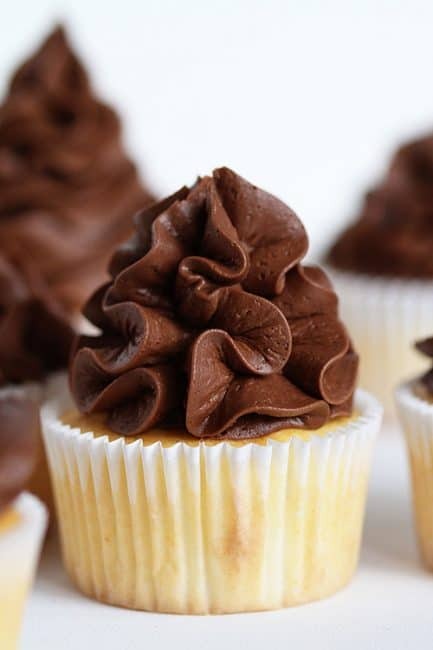 Start by baking cupcakes and allowing them to cool before frosting. 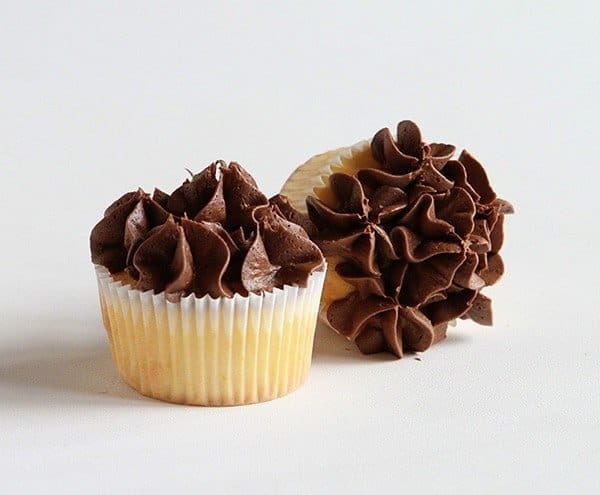 Prepare your buttercream and place it into pastry bags fitted with your tip. 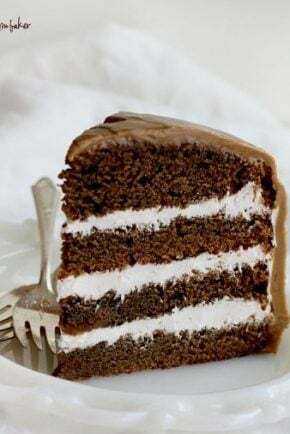 (Detailed information on how to use piping bags and how to double bag here) Practice on a piece of wax or parchment paper first to get a good grasp of the pressure needed and flow of frosting. 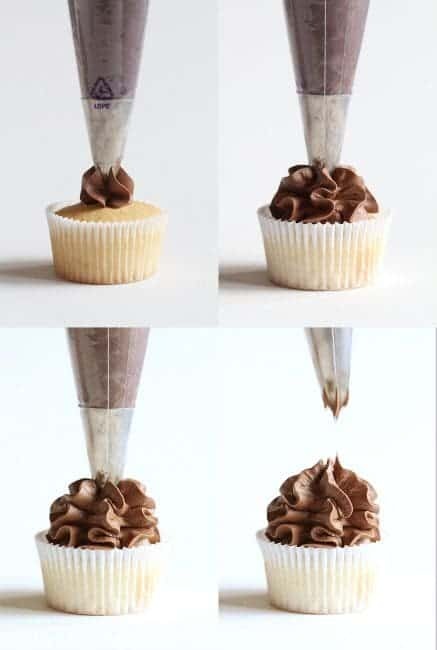 Now you are ready to start piping on your cupcakes! 1. Apply slight pressure and make a dollop in the center (without releasing pressure). 2. Still applying pressure, slowly move tip out from the center and start to circle around center dollop. 3. Make sure tip remains at a 90-degree angle. 4. Complete one circle around the center and then release pressure. 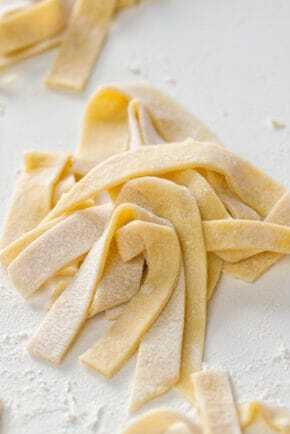 Variation: Applying extra pressure will create a little “ruffle” along the edges of the rosette. You can see that here. 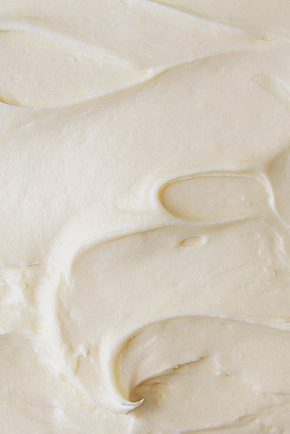 It’s a billowy cloud of buttercream deliciousness! 1. 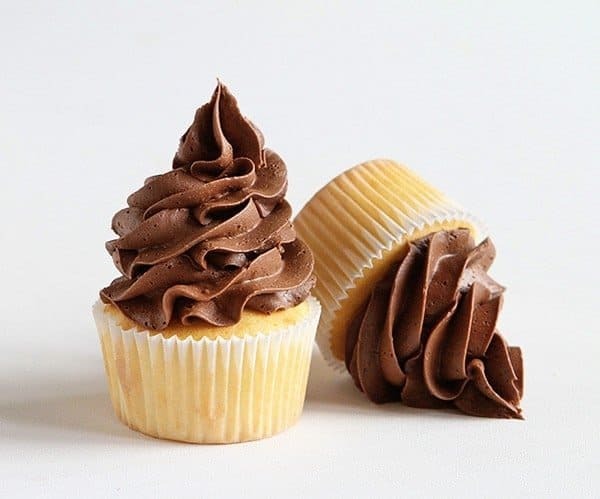 Start by applying pressure to the frosting bag in the center of the cupcake. The tip should be straight up and down. 2. Apply more pressure and raise tip just slightly. 4. Release pressure and lift tip straight up. Variation: Use two-tones of color in the frosting. 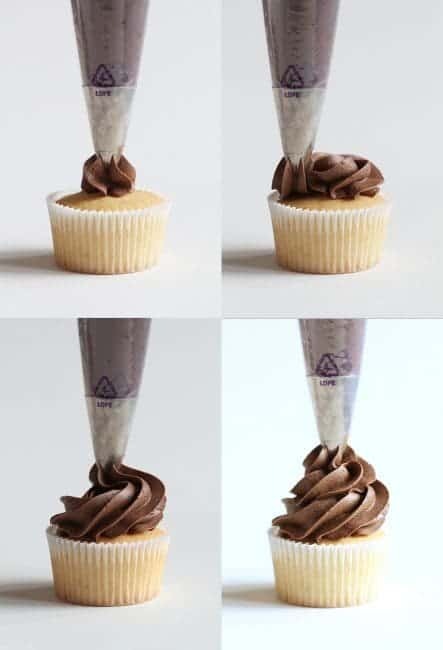 By far one of my favorite ways to decorate a cupcake, but be warned that it is a lot of frosting. 1. Start at the outer edge of cupcake and hold bag at 90-degree angle. Apply slight pressure to frosting bag. 2. Moving tip upward quickly, release pressure on the bag. 3. Repeat that same motion around the entire cupcake, then place mini flower dollop in the middle. Variation: Twist bag as you are applying pressure. This technique is extremely beautiful when using soft pastel colors. This is my go-to method when I am making cupcakes for events. People never fail to oohh and aahh! 3. Make one complete rotation around the center then start around again, only making your circle slightly smaller while you are moving up. 4. Move tip around in one final small rotation (three tiers in all), then quickly move tip up while releasing pressure on the bag. 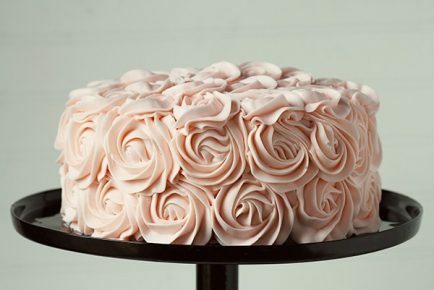 Variation: Apply extra pressure to create a bit of a “ruffle” on the edges of the frosting. I like this specific method because you can make a “clean” version and a really really ruffly (that’s totally a word) version. See here! And on a cake here! So what is my favorite? Which of the four is your favorite? So helpful and informative! The first is my favorite. 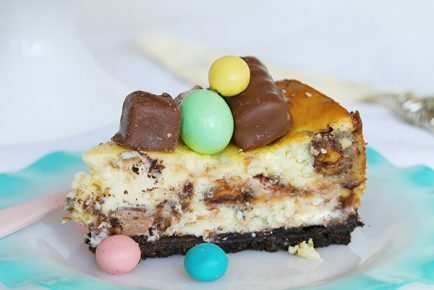 I will have to try it! My problem (I guess) was not starting with a nice dollop in the center. 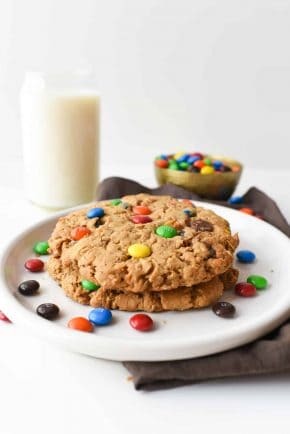 LOVE the fluff frosting technique. I will use that all the time! Just beautiful! Thanks for the tutorial! Wow I just saw your post on Facebook, so sorry to hear about all the Haters on your blog, I love all that you do and if the Haters don’t like what you do they should just move on with out any mean and hateful comments! Keep your head and keep doing what you do and how you do it!! How cares what they think!! Keep going!! I think your very talented and very thing you make looks so professional. ??? ?